My grandfather is visiting me in Seattle this week along with my parents. He is 98 and just the way I hope to be if I am ever that age. Fit, happy, and he always has something nice to say about everyone and everything. And he is something of a gourmand. We are four generations under one roof when everyone is home, and I try to be mindfully grateful for this time together. But while one half of my brain is enjoying the sight of my grandfather laughing at my baby’s hysterical giggles, the other half is thinking ahead to happy hour. Happy hour was a religious observance in my grandparents’ home. Five o’clock? Drinks magically appeared, ice cubes tinkled in glasses, salty snacks graced the coffee table, everyone stopped what they were doing and came together. Time has not diminished my grandfather’s appreciation of this ritual, and why should it? It’s never a bad idea to wind down your day with a tasty beverage and the people you love. These crackers, really a savory shortbread, are perfect cocktail hour fare. I’ve also made my grandpa those rye crackers, of course. This recipe is Ina Garten’s. You need to allow at least 30 minutes to chill the log of dough, or you can make the dough ahead of time, freeze it for a month or two and then just let it defrost slightly before slicing and baking. 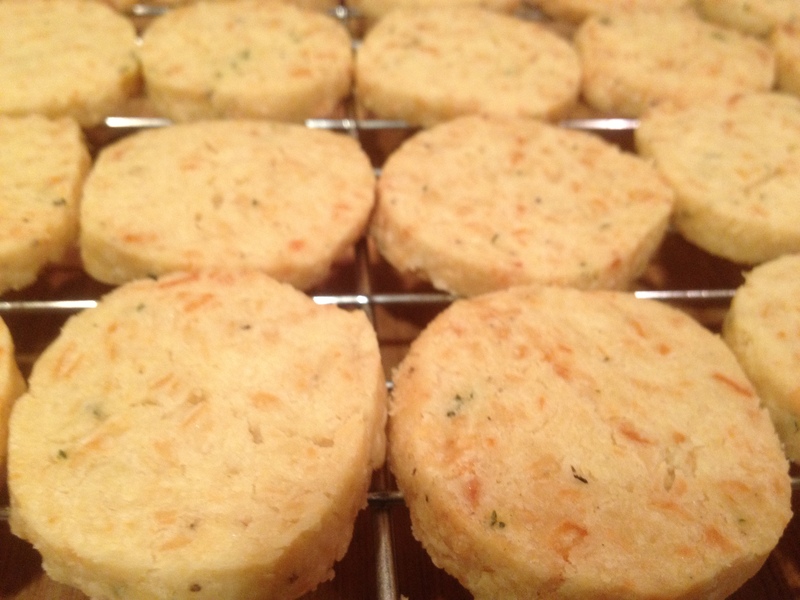 Parmesan and Black Pepper Crackers: Start by softening a stick of butter in your mixer. Add 3/4 c. grated Parmesan, 1 1/4 c. flour, 1 tsp. fresh thyme leaves, 1/4 tsp. kosher salt, and 1/2 tsp. freshly ground black pepper. Mix again. If the dough is too dry (if it doesn’t form crumbs when pinched together), mix in a few spoonfuls of water or milk. Turn the dough out onto a piece of plastic wrap, shape into a 13″ log, wrap well and freeze for 30 minutes. Slice about 1/4″ thick and bake on an ungreased cookie sheet at 350 for 20-25 minutes, until the crackers begin to turn golden brown. Cool completely on a wire rack. Serve at happy hour. This entry was posted in Baking, DIY, Snacks and Apps and tagged baking, cooking, crackers, DIY, food, happy hour, homemade, lifestyle, recipes on February 23, 2012 by emmycooks. Nom, nom, nom! 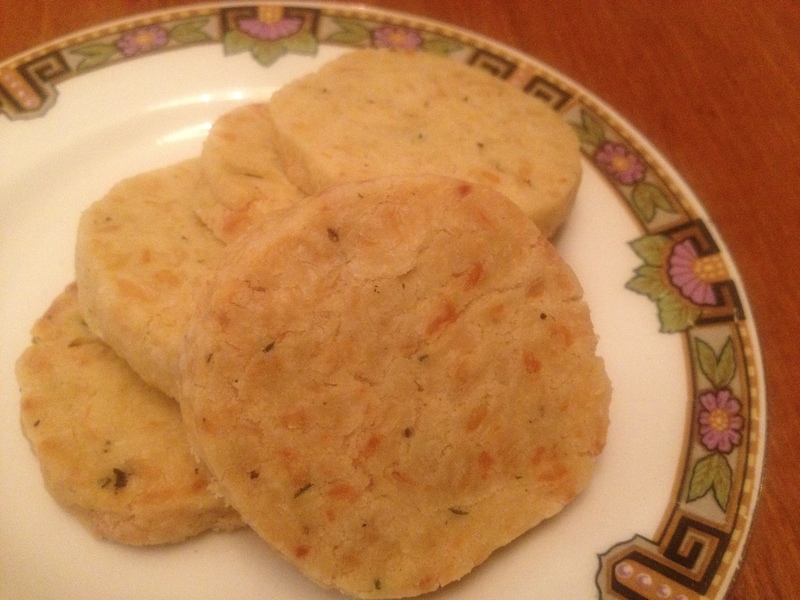 I’ve been obsessed with savory cookies lately though I’m not sure why. Can’t wait to try these! Stay tuned, then–I also made a savory oatmeal cookie with rosemary that will appear here soon! Any man who makes happy hour a religious institution gets a big, shiny gold star in my book! And these crackers looks amazing! I have always loved the combo of parm and black pepper. Yummy, yummy, yummy! I certainly admire your grandparents’ commitment to happy hour as a time to come together, commune and unwind at the end of the day. I made crackers similar to these once, and they were perfect nibbles with a cocktail. My only caution is not to leave them unguarded on the coffee table, lest your dog come along and eat most of the plateful, as happened to me! Wow, these are gorgeous. I can’t wait to try them!